Sausage is a convenient food available in a great number of varieties and flavors. Sausages are an excellent source of high quality protein, containing all the essential amino acids in appropriate amounts necessary for growth, maintenance and repair of body tissue. Sausage also provides significant amounts of vitamins and minerals. Sausage: Chopped or ground meat that has been blended with spices and other seasonings and usually stuffed in natural or manufactured casings. The origin of meat processing is lost in antiquity but probably began when mankind learned that salt is an effective preservative. Sausage making evolved as an effort to economize and preserve meat that could not be consumed fresh at slaughter. In sausage making, quality standards are maintained while using most parts of the animal carcass. Good sausage makers are as discriminating about what goes into sausage as winemakers are about selecting grapes. Early sausage makers found that a wide range of raw ingredients could be used. The primary ingredients of sausage were the parts of the animal carcasses that could not be used in other ways. Today many primal parts are used in the production of sausage; however, the less tender cuts, organ meats and even blood can be made delicious when ground, spiced and cased. The procedure of stuffing meat into casings remains basically the same today, but sausage recipes have been greatly refined and sausage making has become a highly respected culinary art. Any product can be made from a wide range of raw materials exposed to rather extreme conditions of temperature and time schedules and be consumer acceptable. Sausage grew in popularity and brought fame and fortune to many sausage makers and to various cities. Today more than 250 varieties are sold, and many of these can be traced back to the town and country of origin. The contemporary role of sausage fits conveniently into our modern lifestyles as an elegant appetizer for entertaining as well as the main course in “quick-and-easy” meals. Furthermore, sausages are a relatively safe product to consume because of the added effects of salt, pH, cure, drying and cooking to preserve the product and eliminate harmful bacteria. Sausages are made from beef, veal, pork, lamb, poultry and wild game, or from any combination of these meats. Sausage making has become a unique blend of old procedures and new scientific, highly-mechanized processes. Traditionally, sausage was formed into a symmetrical shape, but it now can be found in a variety of shapes and sizes to meet consumers’ needs. Many sausage products are vacuum packed, freshness dated and 100% edible. 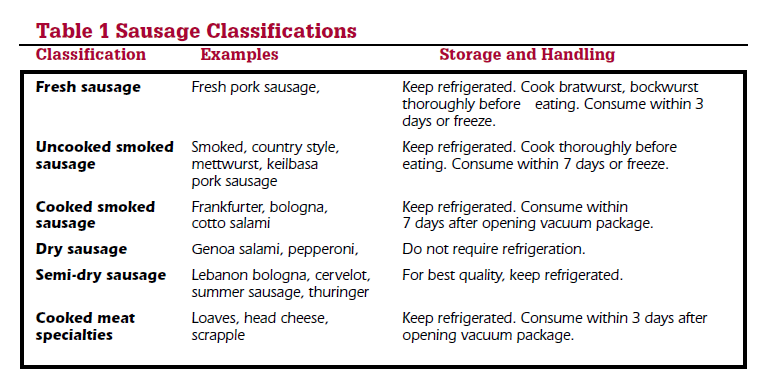 Sausages can be classified in a variety of ways, but probably the most useful is by how they are processed (Table 1). Processing methods give sausages easily recognizable characteristics. It only requires a grinder, a good meat thermometer and some general household items to make excellent sausage. If you do not have a grinder, you can purchase ground meat from the store. Many products do not need to be smoked, but liquid smoke can be added to give the smoky flavor desired, or you may add a small portion of a cooked, smoked product like bacon to produce the smoky flavor. You can purchase a household smoker or make one. An old refrigerator converted to a smokehouse works quite well if you need to smoke the product. Smokehouses can be as simple as a tarp covering or as sophisticated as a commercial unit. Sausage making is a continuous sequence of events. Each step in the proper sequence is important to a successful operation. It is not practical to consider each step separately or to assign more importance to one phase or operation, but for convenience and illustration, we can break sausage production down into four basic processes: selecting ingredients, grinding and mixing, stuffing, and thermal processing. The finished product is only as good as the ingredients it contains. Meat should be fresh, high quality, have the proper lean-to-fat ratio and have good binding qualities. The meat should be clean and not contaminated with bacteria or other microorganisms. In other words, meat used in sausage production should be as safe as any meat you would prepare in your kitchen. 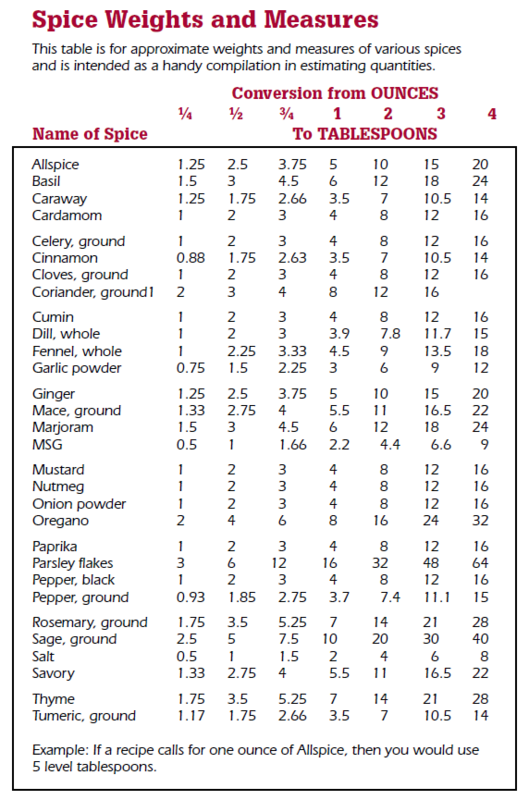 Selecting spices and seasonings and combining them in proper amounts is important. They must complement each other to create a satisfying product. Cure, an essential part of some formulations, is sodium nitrite (usually 6 percent) on a salt base. It usually can be purchased at a local locker plant. Sodium nitrite is very necessary to inhibit production and growth of the deadly toxin produced by the microorganism Clostridium botulinum. It also gives the characteristic cured color to a sausage product and improves flavor. Commercial products such as Freeze Em Pickle, Tender Quick and saltpeter can be found in markets and at drugstores. If these are used, be sure to follow directions on the packages. For safety, keep the temperature of the meat as cold as possible during grinding and mixing. The usual procedure is to grind the various meats coarsely and then add the rest of the ingredients, mixing thoroughly. The product is then ground again to the desired consistency. Mixing should be done before the final grind. Grinding improves the uniformity of the product by distributing the ingredients and making the particles the same size. Unless you have special equipment, it is desirable to work with small batches (up to 25 pounds) so the cure and seasoning can be more evenly distributed. If you don’t have a grinder, buy ground meats, add the seasonings and mix thoroughly by hand. It is not necessary to stuff fresh sausage meat. It can be left in bulk form or made into patties. Most sausage, however, is made by placing the ground ingredients in some type of forming device to give them shape and hold them together for thermal processing. The casing materials may be natural or manufactured. Natural casings are the gastrointestinal tracts of cattle, sheep and hogs. Generally, hog casings are the most suitable for home use and work quite well for Polish and breakfast-type sausages. They are digestible and are very permeable to moisture and smoke. All casings preserved in salt must be soaked in lukewarm water for at least 30 minutes before use. Flush each casing under cold water, running cold water through the casing. This removes excess salt from the casing. Unused casings can be drained, covered with salt and frozen. Fibrous casings are more suitable for summer sausage and similar products because of their greater strength and the variety of sizes available. They are permeable to smoke and moisture and can easily be removed from the finished product. These casings should be soaked before use in 80 to 100 F water for at least 30 minutes, but not more than four hours before use. If the casings are not pre-stuck they should be punctured with a knife point or pin to eliminate air and fat pockets in the finished sausage. Collagen casings contain the attributes of both natural and fibrous casings. They have been developed primarily for use in products such as fresh pork sausage and pepperoni sticks. They are uniform in size, relatively strong and easy to handle. These casings also are used for the manufacture of dry sausages, because they are permeable and will shrink. For cooked products that are generally water-cooked (like braunschweiger), plastic casings impermeable to water are used. Sausage is smoked and heated in order to pasteurize it and extend its shelf life, as well as to impart a smoky flavor and improve its appearance. Smoking and heating also fixes the color and causes protein to move to the surface of the sausage so it will hold its shape when the casing is removed. A few products, such as mettwurst, are smoked with a minimum of heating and are designed to be cooked at the time of consumption. Others, such as liver sausage, are cooked but not smoked. Procedure for smoking polish sausage: After stuffing in hog casings (pre-flushed), let hang and dry. Smoke at 120 F for one hour, 150 F for one more hour, then at 170 F for two hours or until an internal temperature of 141 F is reached. Remove from smokehouse and spray with hot water for 15 to 30 seconds. Follow with cold shower or dip in a slush tank until internal temperature reaches 100 F. Let dry for one to two hours. Place in a cooler. Procedure for smoking summer sausage: After stuffing in casing, smoke at 140 F for one hour, 160 F for one more hour, then at 180 F for two hours or until the internal temperatures reach 155 F. Remove from the smokehouse and follow the same procedure as for polish sausage. Procedure for making cooked sausage: After stuffing the ground ingredients into an impermeable casing, put the sausage into a pan of water. Heat water to 170 F and hold it there until the sausage reaches 155 F. A thermometer is essential for obtaining proper temperature. The water should not boil, as this will ruin the product. If you are making a sausage product using cooked meat, be sure the meat was cooked with low heat. • Wash your hands for at least 20 seconds with soap and water before beginning to work and after changing tasks or after doing anything that could contaminate your hands such as sneezing or using the bathroom. • Start with clean equipment and clean thoroughly after using. Be sure all surfaces that come into contact with meat are clean. • Sanitize surfaces with a solution of 1 tablespoon chlorine bleach per gallon of water. Allow to air dry. • If using frozen meat in sausage formulations, thaw it in a cooler on the lowest shelf to avoid dripping of juices on ready-to-eat foods. Keep raw meat separate from other foods. • Marinate raw meat in the refrigerator. • Keep meat as cold as possible (40 F or lower) during processing. 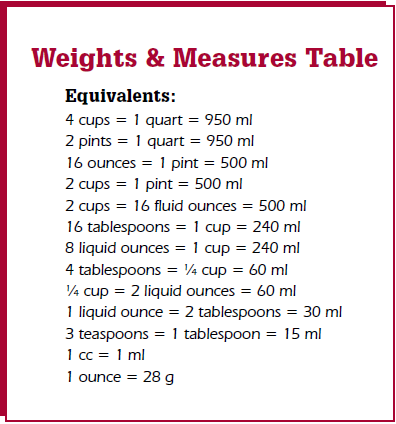 • If dehydrating meat, don’t rely on the dial settings. Measure the temperature of the dehydrator with a calibrated thermometer. *NOTE: Temperature is very important when making jerky. The USDA Meat and Poultry Hotline’s current recommendation for making jerky safely is to heat meat to 160 °F before the dehydrating process to assure that any bacteria present will be destroyed by wet heat. Recent work at the University of Wisconsin demonstrated that the following time-temperature combinations are effective at killing E. coli 0157:H7 in jerky products. Although the lower temperatures are considered effective at killing bacteria, it is recommended that dehydrator temperatures of 145 F or higher be used. Monitor the temperature of the dehydrator by placing the metal stem of a dial thermometer between dehydrator trays, or create an opening for the stem by drilling a hole through the side of the tray. Source: Wisconsin Cooperative Extension Service, Meat and Animal Science Department. University of Wisconsin — Madison. This recipe uses a pre-cook phase. 1. Slice 5 pounds of meat (¼-inch strips) with the grain, not crosswise. Use fresh lean meat free of fat and connective tissue. Spread out meat and sprinkle on 3 Tbsp. salt, 2 tsp. ground black pepper, and 2 Tbsp. sugar. Put the meat in a pan or dish and let stand for 24 hours in the refrigerator. 2. Pound the meat on both sides to work in the spice. Optional: Dip strips of meat in a liquid smoke solution (five parts water to one part liquid smoke) for one to two seconds for added flavor. 3. Make a brine by dissolving ¾ cup salt, ½ cup sugar, and 2 Tbsp. 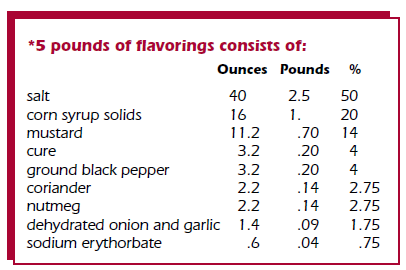 ground black pepper in a gallon of water. Stir to dissolve the salt and sugar. 4. Bring the brine to a low to medium boil. Immerse the seasoned meat strips (a few at a time) into the boiling brine until they turn gray (approximately one to two minutes). Remove meat from brine, using clean tongs or other utensils that have not contacted raw meat. 5. Spread out meat on a clean dehydrator rack or on a clean rack in the top half of a kitchen oven. If you use a kitchen oven, open the oven door to the first or second stop. Heat at 120 to 150 F (lowest oven temperature) for nine to 24 hours or until the desired dryness is reached. Remove jerky from oven before it gets too hard or brittle. Properly dried jerky should crack when bent in half but should not break into two pieces. 6. Store jerky in clean jars or plastic bags, or wrap it in freezer paper and freeze. If kept dry, properly prepared jerky will last almost indefinitely at any temperature, but its quality deteriorates after a few months. **Source of recipe: You and Your Wild Game, 1984 by R.A. Field and C.A. Raab, University of Wyoming Agricultural Extension Service, B-613R, p. 58. Coarse-grind meat trimmings. Add salt, water, sugar, cure and spices. Regrind through ¼-inch diameter plate and stuff into pork casings. As this is a fresh sausage, no smoking is necessary. Product must be cooked before serving. Using 1-1½ ounces per pound of meat, rub the salt, sugar and nitrate mixture onto the beef, making sure all areas are well covered. Rub the beef twice at three to five day intervals. Allow two days per pound of meat for the cure to complete. This may also be calculated by using seven days of curing time per inch of thickness of the cut. After the beef is cured, rinse it with cold water several times; then hang it and allow to dry for 24 hours. Apply a light or heavy smoke as desired. Hang in a dry, well-ventilated room for further drying. NOTE: Lamb or venison can be substituted for beef. Use large lean pieces, such as the round or legs, and separate into top, bottom and tip. ** If you prefer to have a cooked product, smoke and cook to an internal temperature of at least 160 F.
Grind pork trimmings, liver and other ingredients to a very fine consistency. Mix in spices, salt and cure. Stuff in moisture-proof fibrous casing and cook in 165 F water bath for 1½ hours or until internal temperature of sausage reaches 155 F. Chill rapidly in water. NOTE: Fat bacon gives smoky flavor. Cook hearts and liver in 180-190 F water until tender; do not boil. Remove cooked items. Reserve broth, and grind hearts and liver with beef suet through ¼-inch plate. Chop onions to a fine pulp. Bring the broth to a boil and sprinkle in oatmeal. Stir vigorously. To the hot mass add the cooked meats, onions, salt and spices. Stuff in moisture-proof casing and cook for about 3 hours in 170 F water, or until internal temperature reaches 160 F. Chill in ice water and keep at 30-34 F. NOTE: Quite perishable. You may want to cut down on the amount of oatmeal. Mix above ingredients together. Drop by large spoonfuls (about ½ cup) into a large kettle of salted boiling water. Cook until brown throughout. Remove from water. May be eaten hot with butter and syrup. To heat up with gravy: cut into small pieces (like potatoes in potato salad) into a kettle or frying pan. Add 1 tablespoon of shortening, sugar to taste and milk. Cook until milk forms a light brown gravy. Serve hot. Additional milk may be added as necessary. Grind meat through a coarse plate, then add spices and mix thoroughly. Grind again through a medium plate. Stuff into hog casing. Smoke at 140 F for proper color development and then raise temperature to 170 F until internal temperature of product reaches 155 F. NOTE: This is a very hot, spicy product. Excellent on pizza and will substitute for pepperoni. Cook heart and tongue in one kettle. Cook neck bones in another kettle. Add enough water to cover meat and simmer until tender (2 to 3 hours). Skim off any extra fat from broth. Remove meat from broth, remove meat from bones and skin tongue. Grind meat through fine plate. To each kettle of broth add the spices and herbs and simmer for 1 hour. Strain broth and add pearled barley. Simmer until barley becomes plump. Mix in cooked ground meat. Add enough old-fashioned oatmeal to soak up excess broth. Season to taste with salt and pepper. NOTE: If a beefier taste is desired, add beef bouillon cubes to broth, form grits into patties and fry. 120 F for smoky flavor. Product must be cooked before serving. Use same procedure as for Polish sausage. Coarse-grind meat trimmings. Add salt, water, cure and spices; mix thoroughly. Regrind through ¼-inch diameter plate and stuff into pork casings. Smoke product to desired color and heat to an internal temperature of 141 F. Product must be cooked before serving. Grind meat through coarse plate. Mix spices in water and pour over meat. Mix thoroughly. Grind through coarse plate again and stuff in hog casing. Using a cool smoke (90 F), smoke for 12 hours. Product must be cooked before serving. NOTE: If you don’t like garlic flavor, cut back on amount. Also could fine-grind the product, if desired. Mix salt and cure with coarse-ground product. Pack in shallow pan and place in cooler for three to five days. Mix in remainder of spices, regrind and stuff in 3-inch fibrous casings. Smoke at 140 F for 2 hours; raise temperature to 160 F for 2 hours, and finish product at 170 F until internal temperature reaches 155 F. NOTE: Can substitute lamb or beef for the venison. Coarse-grind meat trimmings. Add water, salt, sugar, cure and spices. Mix thoroughly. Regrind through ¼-inch diameter plate. Stuff into pork casings. Smoke product to desired color and heat to an internal temperature of 141 F. Product must be cooked before serving. Coarse-grind meat trimmings. Add water, salt, dextrose, cure and spices. Regrind through ¼-inch diameter plate. Stuff into pork casings. Smoke product to desired color and heat to an internal temperature of 141 F. Product must be cooked before serving. From the above formulation, different products can be made. These differ in texture and taste. • wieners – stuff in sheep casing; smoke and cook to 155 F internal temperature. • dinner franks – stuff in hog casings; smoke and cook to 155 F internal temperature. • ring bologna – stuff in beef casing; form into a ring; smoke and cook to 155 F internal temperature. • bologna – stuff in 6-inch diameter fibrous casings; smoke and cook to 155 F internal temperature. • Leona – add 20 pounds cooked, diced and skinned hog jowls plus 1/3 cup garlic powder to the emulsion; stuff into 2-inch diameter fibrous casings; smoke and cook to 155 F internal temperature. • pickle and pimento loaf – add 5 pounds sweet pickles and 5 pounds pimentos. Stuff into parchment-lined metal molds or waterproof fibrous casing. Can be water-cooked or baked to internal temperature 155 F.
• macaroni and cheese loaf – add 5 pounds cheese and 5 pounds cooked macaroni. Proceed as with pickle and pimento loaf. NOTE: Monosodium Glutamate (MSG) intensifies and enhances flavor but does not contribute a flavor of its own. It is the sodium salt of glutamic acid, an amino acid. One to two percent of the population may be sensitive to MSG and have mild to transitory reactions in some circumstances when they consume significant amounts, such as would be found in heavily enhanced foods. 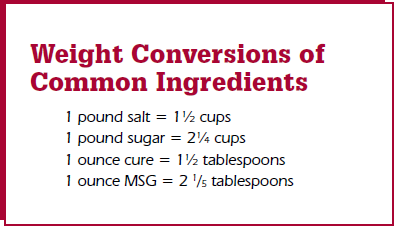 FDA believes that MSG is a safe food ingredient for the general population.